As People’s Pundit Daily (PPD) reported, the “outrage” among the rank-and-file was threatening to “boil over” if Attorney General Sessions didn’t fire Mr. McCabe on Friday. The Federal Bureau of Investigation disciplinary process conducted by the Office of Professional Responsibility recommended he be terminated after the Department of Justice (DOJ) Inspector General Michael Horowitz discovered he lied during an internal review. Attorney General Session made the decision that could impact the 21-year veteran’s pension just days before his retirement went into effect. FBI pensions are determined by a formula that is based on years of service and prior salaries. Mr. McCabe was removed from his post over misconduct and apparent corruption, but had been trying to ride out the scandals currently at the center of at the FBI and DOJ. Internal investigations include but are not limited to the Clinton email case and abuses of secret government spying programs authorized by the Foreign Intelligence Surveillance Act (FISA). Section 702 of FISA allows intelligence agencies to collect information on foreign targets abroad. However, as People’s Pundit Daily (PPD) previously reported, it has been “routinely” abused and misused to spy on domestic targets, including President Trump, his associates and other U.S. citizens. A bombshell memo authored largely by Rep. Devin Nunes, the Chairman of the House Permanent Select Committee on Intelligence (HPSCI), revealed officials at FBI and DOJ used false information to obtain a FISA warrant to spy on Team Trump via peripheral advisors Carter Page. The FISA court was not explicitly made aware that the dossiers were political opposition research funded by the Democratic National Committee (DNC) and the campaign for Hillary Clinton. Christopher Steele, a former MI6 British Intelligence Officer and author of the dossier, was notably the head of the Russia desk at MI6. Ironically, he almost exclusively used Kremlin sources connected to Russian President Vladimir Putin. The nonprofit Campaign Legal Center (CLC) has filed a complaint with the Federal Election Commission (FEC) alleging both the Clinton campaign and the DNC violated campaign finance law by failing to accurately disclose payments for the dossier. The DNC and Clinton campaign hired the shadowy smear firm Fusion GPS, who in turn hired Mr. Steele. The HPSCI concluded that there is “no evidence of collusion” between Russia and the Trump campaign. The ending of the probe comes a few weeks after Deputy Attorney General Rod Rosenstein announced no “American was a knowing participant” in any election-meddling plot by the Russians. But the Republican-led probe uncovered corruption that no doubt would’ve gone unknown to the American public had President Trump not won the election in 2016. In 2015, when Hillary Clinton was the subject and target of serious criminal investigations, Mr. McCabe’s wife ran as a Democrat for a Virginia Senate seat. She received at least several hundreds of thousands of dollars — an unheard of amount for a state senate race — from a group tied to Governor Terry McAuliffe, a longtime Clinton ally. Mr. Horowitz’s highly-anticipated findings will be the result of numerous investigations into misconduct on behalf of top-level officials in the Obama Administration, including Mr. McCabe and his former boss Mr. Comey. The inspector general “succeeded in using forensic tools to recover text messages” between anti-Trump FBI officials Peter Strzok and his lover Lisa Page. The FBI agent and lawyer were involved in an apparent effort to undermine President Trump before and after the 2016 presidential election. 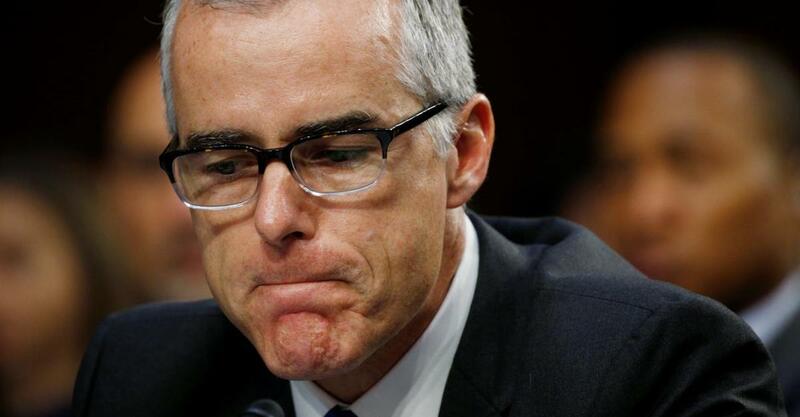 The two lovers discussed needing to talk to “Andy” about an “insurance policy” in the event President Trump defeated Mrs. Clinton, a widely-believed reference to Mr. McCabe. Subsequent texts and other reports indicate that the insurance was the so-called “Russia collusion” investigation. People’s Pundit Daily (PPD) most recently reported that U.S. District Court Judge Rudolph Contreras, who presided over the case against former National Security Adviser Michael Flynn, had a personal relationship with Mr. Strzok. Meanwhile, John Dowd, who serves as President Trump’s personal lawyer, provided The Daily Beast an emailed statement applauding the firing of Mr. McCabe. He said Mr. Rosenstein should follow the example of his boss, Mr. Sessions. Mr. Dowd also emailed The Daily Beast the text below, which is an annotated version of a line from a well-known 20th century play. Don King: Corrupt System Must Destroy Donald Trump, "Whatever the Cost"